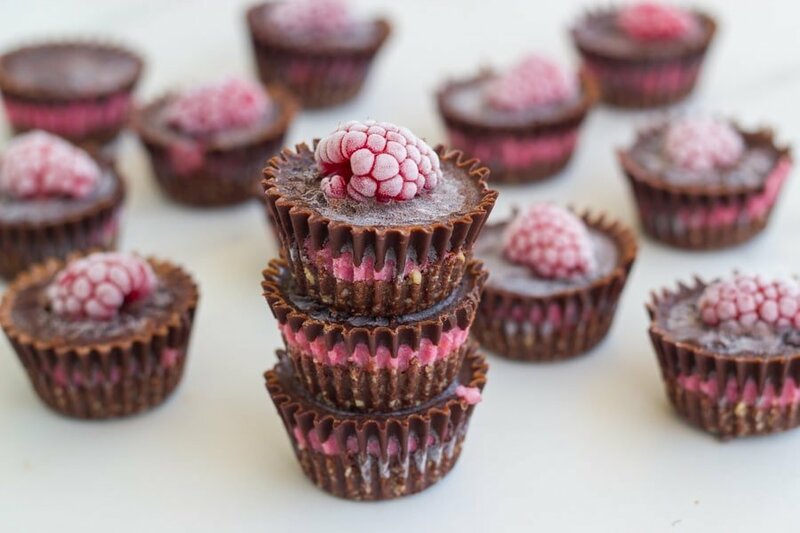 Raw chocolate raspberry slice bites! 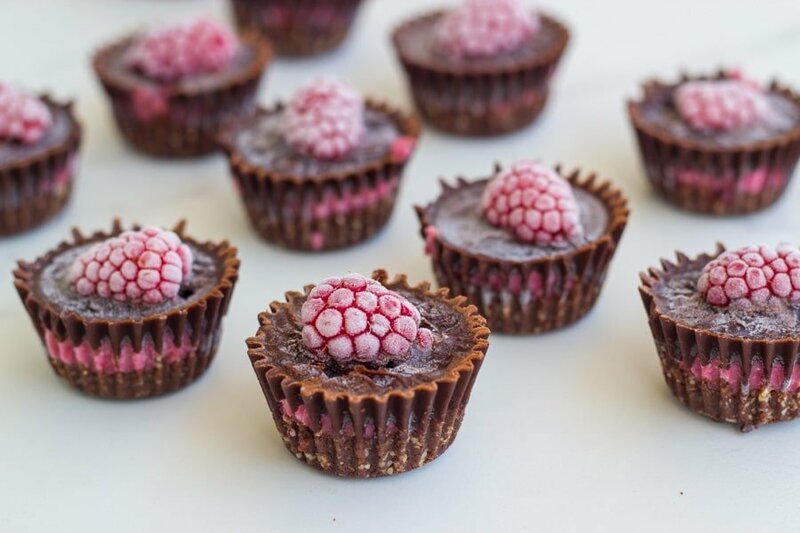 These healthy raw treats are seriously amazing. They are gluten, dairy and refined sugar free and the Thermomix version is also included! 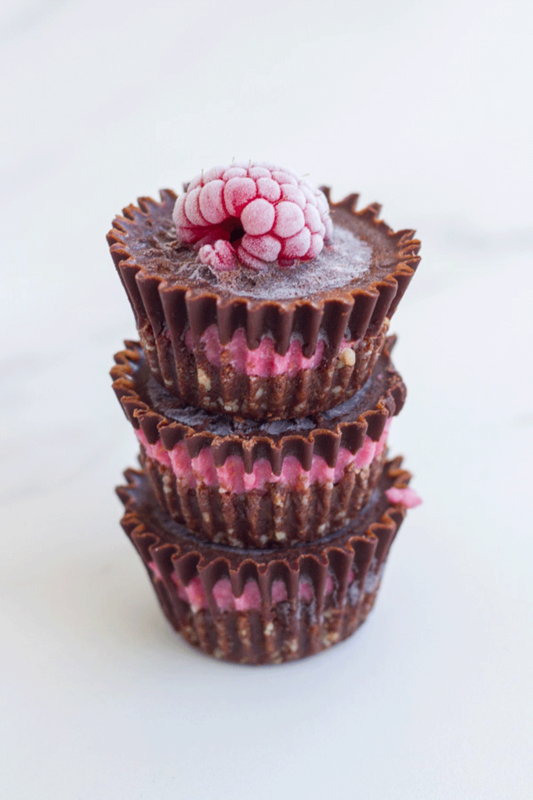 I am so excited to have finally made my raw chocolate raspberry slice into these raw chocolate raspberry slice bites. This recipe has been a long time coming and boy is it amazing!! 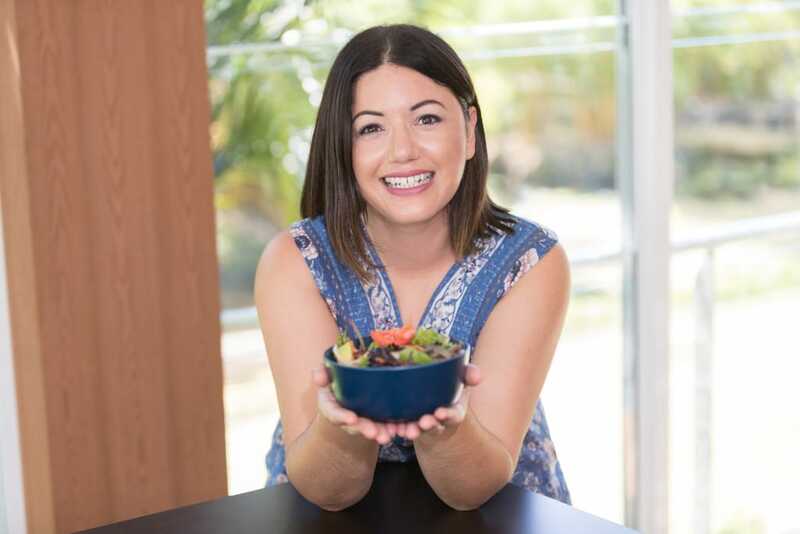 I have been making quite a few of my raw desserts into mini version, including my raw caramel slice bites, raw mini lime cheesecakes and raw mini carrot cake bites.I am a big fan of making mini raw desserts! It takes a little bit longer to prepare however, they are much easier to serve. Sometimes when you slice a raw dessert that has a chocolate layer on top, the chocolate can split or break apart. I am finding with these mini versions, the recipe holds together much better and they also look really pretty! 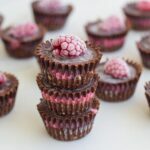 As usual these raw chocolate raspberry slice bites are gluten, dairy and refined sugar free and I have also included the Thermomix version. I hope you enjoy my latest dessert creation. To make the raspberry layer, add the ingredients to a high speed blender and process until completely combined and smooth. Spoon the mixture onto the bases and smooth over with the back of a teaspoon and place back into the freezer. To make the chocolate layer, melt the coconut oil in saucepan on low heat. Once melted, remove from heat and add the sweetener. Whisk briskly until well combined. Then add the cacao powder, stirring until well mixed through. Spoon the chocolate layer on top of the raspberry layers and place back into the freezer and let it set completely, approximately 3-4 hours. 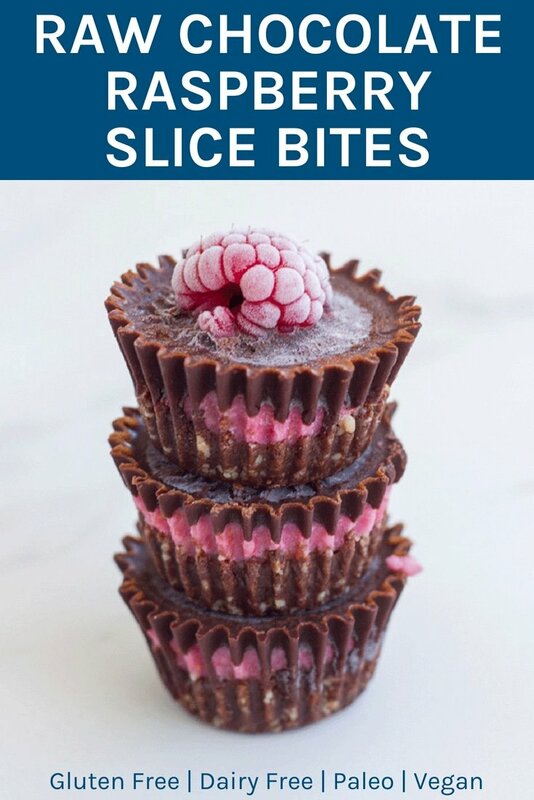 1) I recommend using either a mini silicon muffin tray, mini muffin liners or cut out little strips of baking paper to use as tabs at the bottom of the regular mini muffin tray, to make it easier to remove them from the muffin tray. 2) If you use frozen raspberries, make sure you thaw them out first and remove any excess liquid before processing the raspberry layer. 3) The cook time does not include the time it takes for this dessert to set in the freezer, approximately 3-4 hours. Add all the base ingredients to the Thermomix bowl and process for 20 seconds / speed 7. Spoon mixture into a 24 mini muffin pan (see note below) and press down with the back of a teaspoon. Place it in the freezer. Add all raspberry layer ingredients to the Thermomix bowl and process for 10 seconds / speed 7. Spoon the mixture onto the bases and smooth over with the back of a teaspoon and place back into the freezer. To make the chocolate layer, melt the coconut oil in the Thermomix bowl at 100 degrees / 1.30 minutes / speed 2. Next, add the maple syrup and mix for 3 seconds / speed 4. Then, add the cacao powder and mix for 10 seconds / speed 5. Spoon the chocolate mixture on top of the raspberry layers and place back into the freezer and let it set completely, approximately 3-4 hours. 3) The cook time does not include the time it takes to freeze this dessert, approximately 3-4 hours.